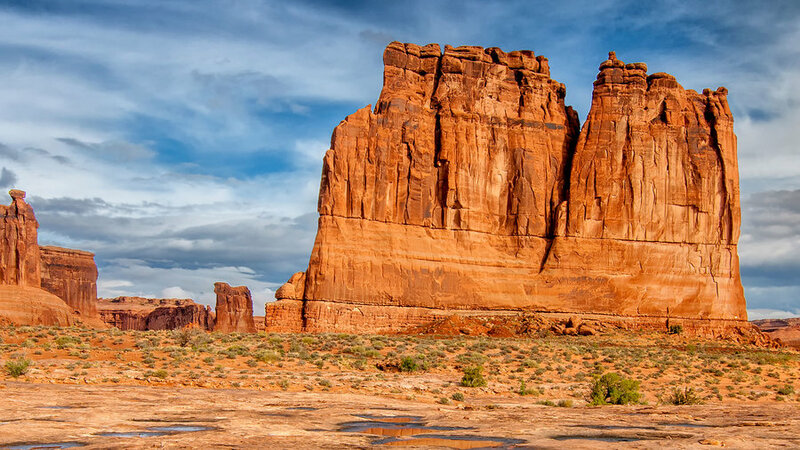 Just past Park Avenue—an area named by early travelers who thought its formations looked like Park Avenue—on the scenic road, Courthouse Towers are reminiscent of those in Monument Valley. You might also recognize the area from the movie Thelma and Louise. Actresses Susan Sarandon and Geena Davis disarm a cop and lock him in the truck of his car here. 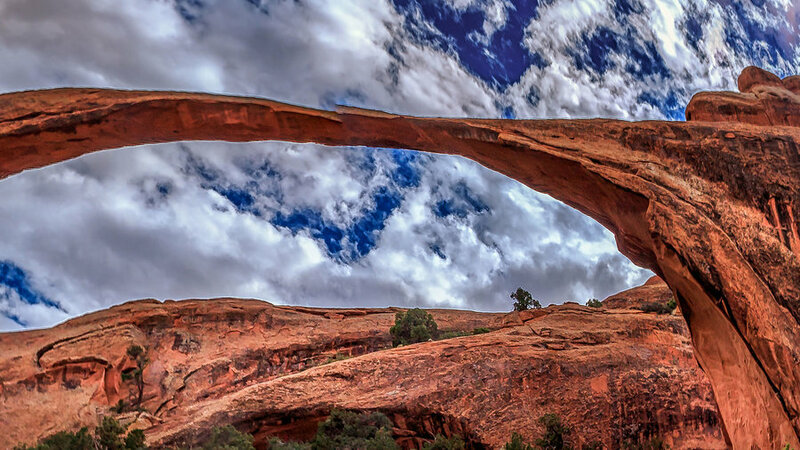 The longest known arch in the park is also among the longest known arches in the world. (The only arch known to be longer is Kolob Arch in Zion National Park.) Landscape Arch spans a distance greater than a football field yet, at its widest, is only 11 feet. Its thinnest point is six feet wide. There are 18 known arches and no developed trails in the Fiery Furnace, a postage-stamp sized area that is among the most geologically unique in the park. 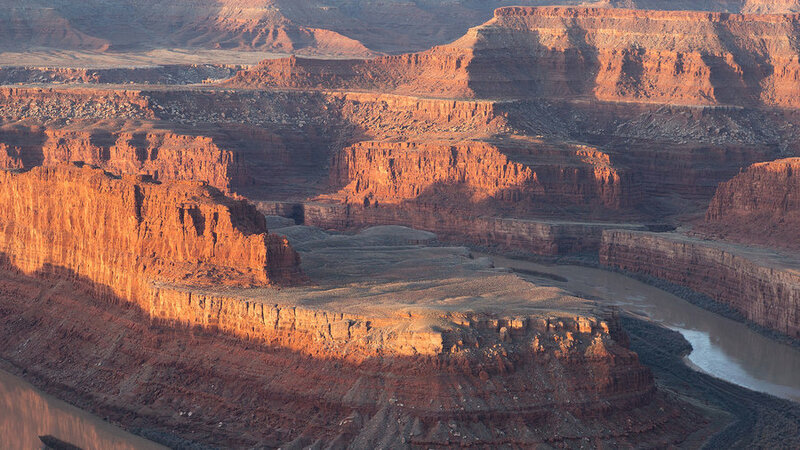 There are two daily ranger-led walks into this maze of fins, towers, and hoodoos. 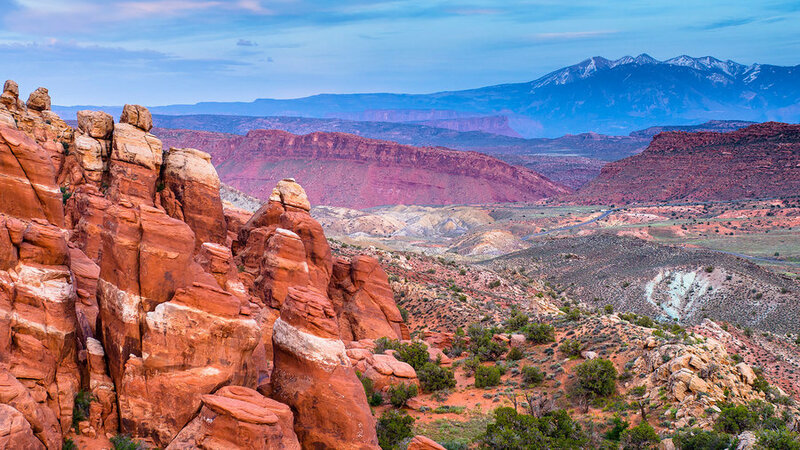 The Fiery Furnace is not named for its temperature, but because, at sunset, its formations glow like embers. 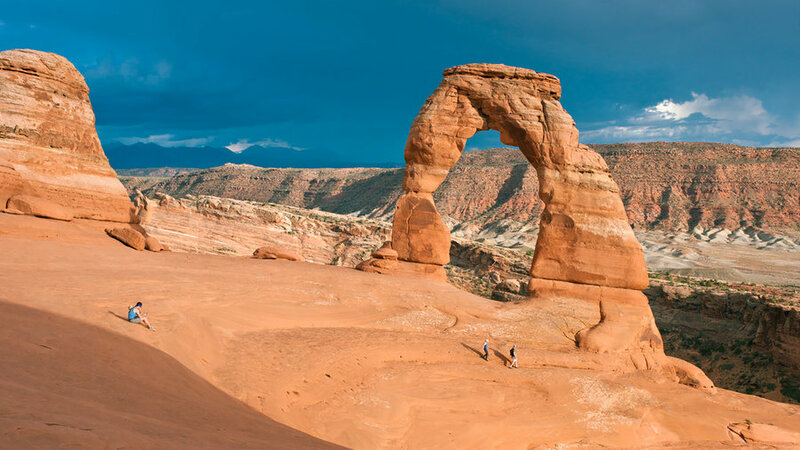 You might recognize Delicate Arch from Utah’s license plates. 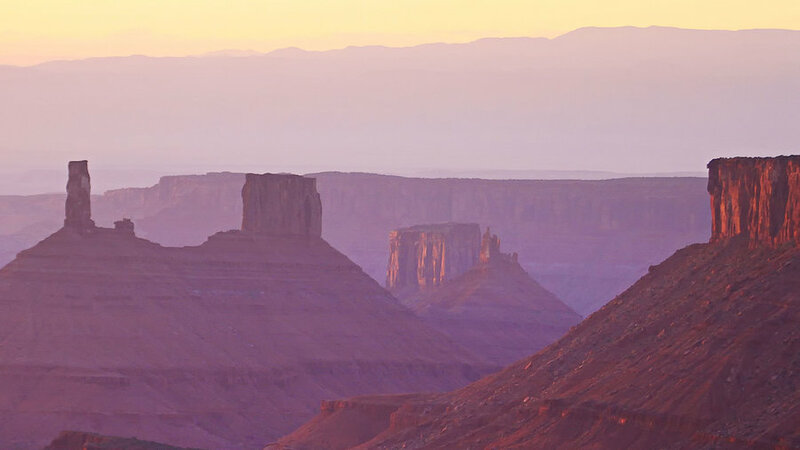 The 33-foot wide and 45-foot tall arch isn’t big by Arches standards, but perched high above Salt Valley and with the La Sal Mountains visible in the distance through its opening, it is one of the park’s most spectacular. Because of chemical and light pollution, 90-percent of the world can no longer see the night skies. 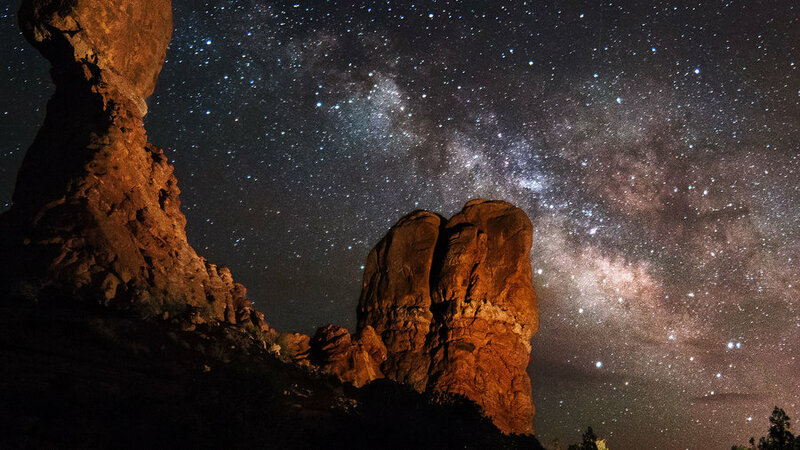 On a typical night in Arches though, as many as 6,000 stars are visible. Once a week park rangers lead at the Devils Garden Campground Amphitheater. 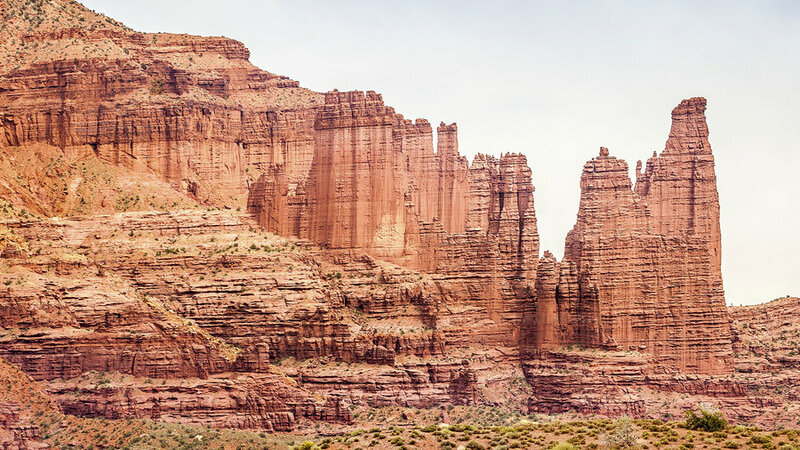 Climbers come from around the world to scale these fantastically shaped mudstone towers in Bureau of Land Management land southeast of the national park. The 2.2-mile Fisher Towers Trail is challenging and designated a National Hiking Trail. About nine miles from the Visitor Center a 128-foot tall hoodoo looks like it is about to lose its top. That will happen eventually, but Balanced Rock is currently securely attached to the spire below it. 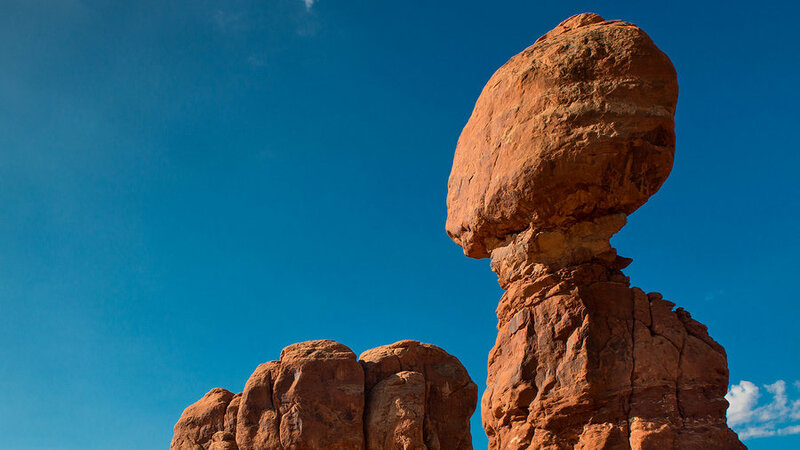 The illusion of the rock being balanced comes from the fact the column and the rock are two different types of sandstone that erode at different rates. Utah Highway 128 winds through this valley dominated by red cliffs and the Colorado River just across the eastern border of Arches National Park. Hiking, mountain biking, climbing, and camping opportunities abound. The sandstone is its most vibrant the hour before sunset. 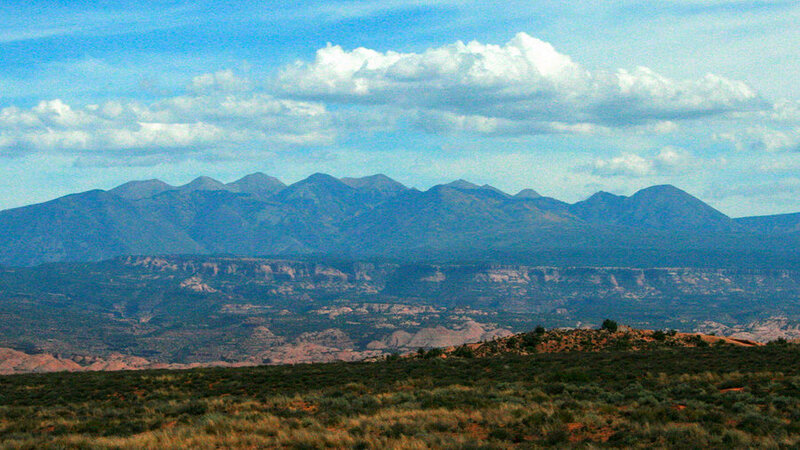 A scenic 60-mile drive winds through the La Sal Mountains, the second highest range in Utah. 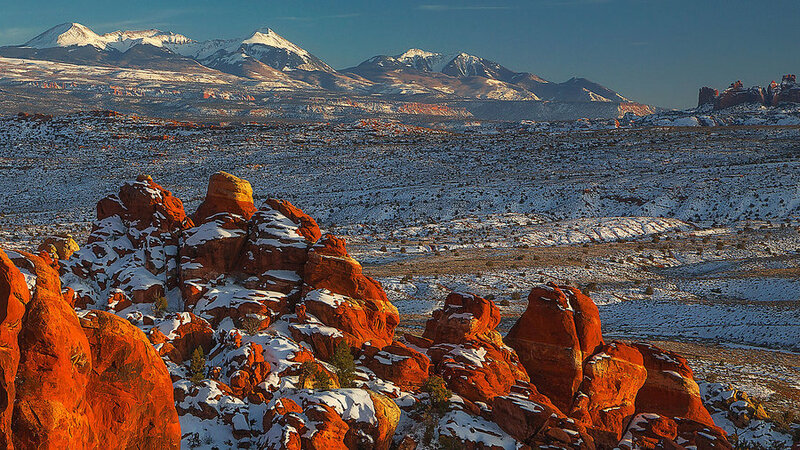 Peaks here rise to over 12,000 feet and, when viewed from Arches, their often snow-capped summits are a dramatic contrast with the surrounding red sandstone. Winter is the quietest time in Arches. Temperatures are sometimes in the single digits and the park gets an average of 11 inches of snow, but visiting at this time makes for dramatic photographs, and there are no crowds to avoid. Where to Dine Near Arches N.P. Where to Stay In & Near Arches N.P.